It was a fine, sunny and cold morning in Ballarat with only dew making the surface of the immaculate ground a little slippery at first. The Banshees won as expected but by not by as much as expected. Not only did the crusaders play well as a team they were playing a team who had their coach on the ground for the entire game actively coaching. The Ireland Banshees have played in both International Cups coming 1st in 2011 and 2nd in 2014 plus victories in Europe. The Europe Crusaders are on their first visit to the international Cup and they are a different mix to that played in Europe earlier. Round #1. Banshees 7 goals 4 behinds = 46 points Vs Freedom 1 goal 2 points = 8 points. The slight wind immediately pushed play to the dead wing and there it remained for long periods of the match. Most noticeable were the European players that were the backbone of defence for the entire game. Coline Duquet #4 had many different opponents as the Irish searched for a player to nullify her influence. #23for the Crusaders took many fine marks to relieve pressure. The Banshees were playing as a team and in contrast it was hard to pick individual stand-out players. After some constructive play Ireland caught the Crusaders outnumbered and Aine Higgins #28 snapped for the resulting goal. That seemed to be a signal to open up play and Ireland started to exert their dominance. Molly Cullen #17 was active marking and passing around the ground She was rewarded later with a gather and a true snap for goal. The second quarter was a rather even affair Linn Gardell #9 was holding her own in the ruck for the Crusaders and the Crusader defence was holding firm and able to rebound at least to the wing. They unfortunately couldn’t push forward and scramble a score but had held the Banshees goal-less until a free kick gave Ireland a goal after the siren. The Banshees rebounded after the long break. 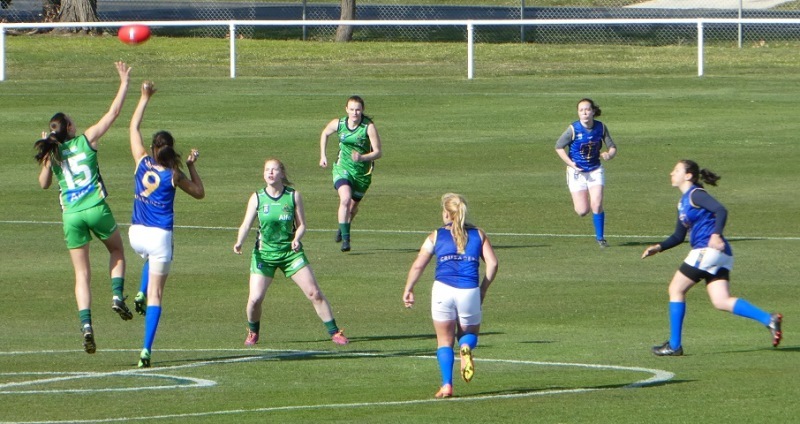 They grubber–kicked a goal through a busy pack just two minutes into the quarter. Players Molly Cullen #17 and # Carol Breen 12 were producing drive for the Banshees and when the Crusaders did manage to take the ball into the forward line this was an excuse for the Banshees to take the ball from fullback around the wing to threaten the forward line. Linda Connolly #14 marked a dropping ball and shot true for a goal. Soon after Ireland scored another goal from a simple tap and snap. Coline Duquet #4 had another opponent as if Ireland were trying to find a full forward who could diminish her influence however weight of numbers let another goal in from close in. The last quarter again was a good display of defence by a number of Crusaders like #23. Banshee Marie Keating #18 was moved to full forward and she did have an immediate effect marking and snapping. First missing then slotting one through for a goal. Linda Connolly #14 marked on the angle and goaled with a nicely judged kick. The Ireland Banshees will be looking for a finals spot. it was not an overly impressive display. The Europe Crusaders have benefited from their first hit-out and now a more cohesive force.